In our modern age of unlimited variety and choice, a stroll around the supermarket allows us to buy whatever we want, whenever we want. Peaches in the winter? Sure! Butternut squash and brussel sprouts in the summer? No problem! Even though choice is convenient, it’s nice to be encouraged by the seasonality, to use different ingredients and like a wardrobe switch from light and airy to warm and comforting. Hong Kong local supermarkets (not the City Super variety) do tend to follow seasonal availability to a certain extent – I for one am waiting with eager anticipation for Wellcome to start stocking pomegranates again! But yesterday, after a typhoon and with the air starting to get cooler, I wanted to fool myself that it was still summer. 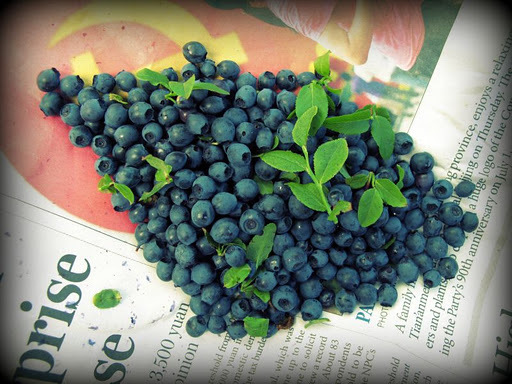 I stepped into my local Wellcome to buy punnets of strawberries, raspberries and blueberries for a summer berry meringue, but there were no raspberries or blueberries anymore! 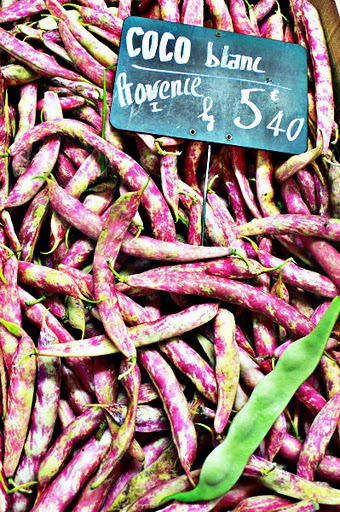 Alas, there’s no denying it – this signals the end of the summer, and the start of pumpkin soups and beef stews. There were, however, still LOTS of strawberries! Some of them still half green, but if you go through all the punnets like I did, you find a couple of decent ones. So my “Summer Berry Meringue” turned into a “Strawberries Galore Meringue”. The recipe below is from Cook with Jamie – My Guide to Making you a Better Chef, a nifty cookbook to have on your shelf with useful and practical tips on cooking traditional dishes with ease. And he makes it a little more playful and fun too – the first sentence on the page for his basic meringue recipe starts with: “Meringues can be tricky buggers…”. I love that! Grease, water or oil on your equipment are the enemy of meringue. I followed Jamie’s tip and poured boiling water over it all, and then wiped everything down with paper towel. This recipe can serve 10 people, so you might want to cut it in half if you’re just doing a small shindig. Mine turned out freakin’ huge, but after second helpings, the leftovers looked more manageable! See that Jackson Pollock-style effect I created on the edge of the bowl? Thats what happens when you press the “ON” button on the mixer instead of the “remove whisks button” by accident, while the whisks are halfway out of the mixture. I highly suggest you don’t do this! Haha 🙂 And if you do, clean up the mess straight away because it’s a pain in the a** to clean once it’s dried! 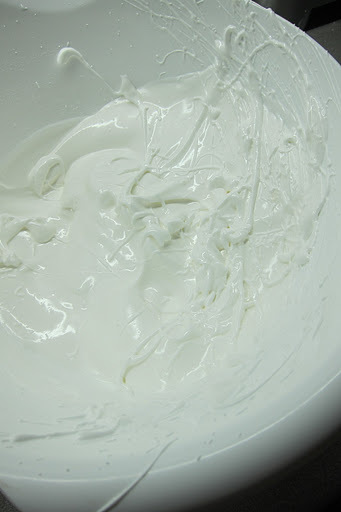 ♥ Whisk the egg whites until they form firm peaks. ♥ With the mixer continually running, add the caster sugar and the salt. Turn the mixer to the highest speed and keep going for 7-8 minutes. It should look shiny, silky and white. Be careful not to over-mix or else it’ll collapse. ♥ Line a baking tray (one that won’t buckle) with baking parchment, and secure it to the tray by dotting a bit of meringue on each corner. 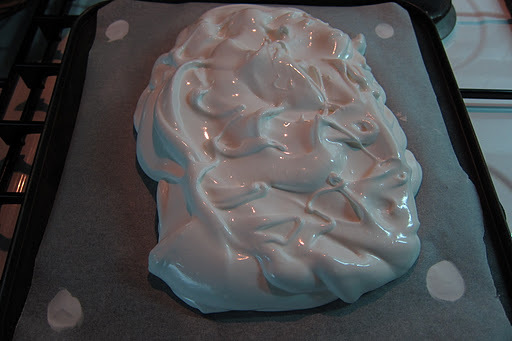 ♥ Pour the mixture on the tray and spread out to whatever shape you want – one big dollop or several small meringues. Space them out because they’ll expand. ♥ Bake in the oven for one hour, take out immediately and let cool. 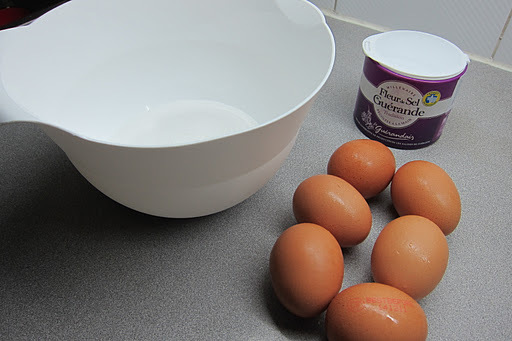 ♥ In a bowl add the cream, vanilla and icing sugar and whisk until it thickens. 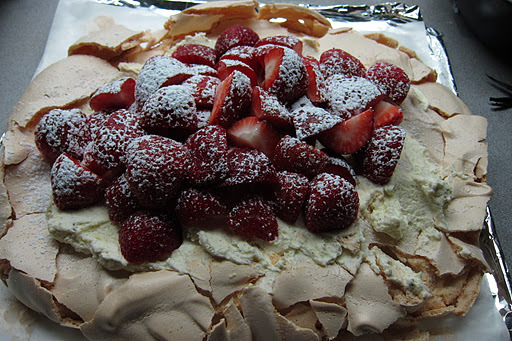 Spread on the meringue, pile up the strawberries and decorate with a sprinkling of icing sugar. Enjoy! 🙂 And try it yourself – it’s super easy to make! 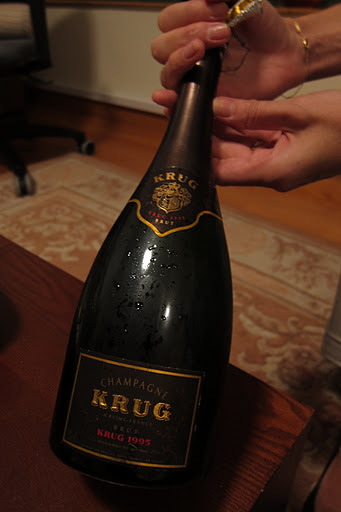 I made this for dinner on Saturday night, and our lovely friends who came to dinner spoiled us rotten by bringing an amazing bottle of champagne – a 1995 vintage Krug – W.O.W. Thank you D&E! looks yummy 🙂 I like it when they are soft and sticky inside,… Good job. Thanks ladies! Jen – perhaps I'll do a kareoke video clip later on haha – I only just learned blogging so it'll be a while before I get to that :-)Shino – you would have loved it then, the inside was like soft and sticky like marshmallow 🙂 Next time I'll add lemon rind for a lemon meringue! Or cocoa powder!